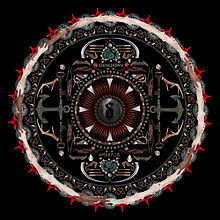 Amaryllis is the fourth studio release by Shinedown. What vocalist Brent Smith, guitarist Zach Myers, bassist Eric Bass and drummer Barry Kerch have done here is taken their time to push their abilities to the limit and the result is a strong release that shows the band’s growth in their song writing and song structure. The album starts off with a shot of “Adrenaline”, a uptempo rocker that serves as an appetizer of things to come. Up next is the first single “Bully”, which hit the top spot on Billboard’s Hot Mainstream Rock Tracks Chart. Unfortunately bullying is still a part of society and it was an important enough subject for Smith to tackle and give us his thoughts on the matter. “Unity” sounds like it could very well become a concert staple with its sing-along chorus. The album really gets interesting with “Enemies”, the hardest hitting track on the disc. It serves as reminder that this band has not gone soft, just expanded their horizons. Songs like “I’m Not Alright” and “I’ll Follow You” show off my point exactly. Particularly the latter as it starts off slow, picks up some speed and even has a hint of gospel flavoring to it. The stellar “Through The Ghost” is another highlight that closes out the affair quite nicely. Amaryllis, like the bands prior release, 2008s The Sounds Of Madness was produced by Rob Cavallo. Cavallo, known for his production of Green Day and The Goo Goo Dolls put his magic fingers to work and in the end the result is a cohesive, yet diverse affair. This marks the bands longest gap in putting out a studio album. The band were not out of the limelight during that time as they focused on performing live shows and they believe that has helped make this album their strongest effort to date. After listening to it, I tend to agree. You will be hearing this band all over the radio airwaves well into the winter.